Exercise and selective serotonin reuptake inhibitors (SSRIs) are effective in treating certain kinds of depression, but little research has tested them together in post-stroke depression, which affects 20 to 80 percent of stroke survivors. Drs. 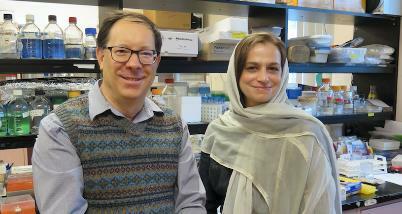 Paul Albert and Faranak Vahid-Ansari investigated this using a novel mouse model they developed for this condition. Surprisingly, they found exercise had no impact on depression, but SSRIs had a much greater impact than expected. In addition to completely eliminating depression and anxiety, SSRIs also completely restored learning and memory. Further studies revealed that stroke caused an imbalance in brain activity in this model, which was rebalanced by the SSRIs but not exercise. This research provides new excitement about possible use of antidepressants to improve memory after a stroke. It also provides a new understanding of which regions of the brain might benefit from brain stimulation after a stroke. Dr. Albert and his team hope to test this in the near future. See Neurotherapeutics for details. Funders: This research was possible because of generous donations to research at The Ottawa Hospital. This study was also funded by the Canadian Institutes of Health Research and the Heart and Stroke Foundation Canadian Partnership for Stroke Recovery.